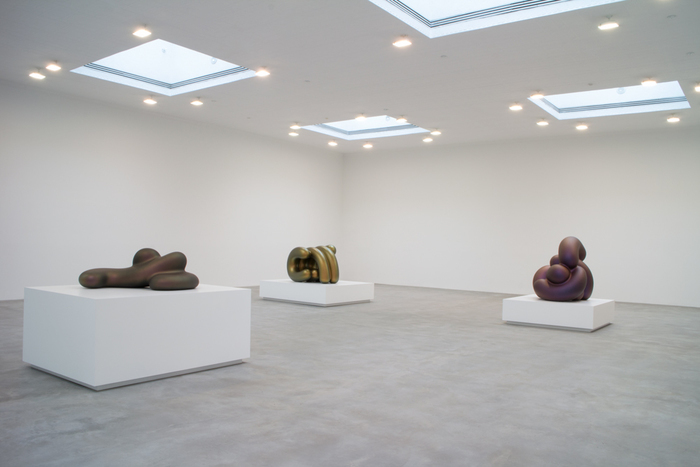 Installation view from Ken Price: Large Sculptures, May 9 – June 28, 2014, Matthew Marks Gallery, New York; Artwork © Estate of Ken Price / image Courtesy Matthew Marks Gallery. Late in life, beginning in the mid-2000s, Price began making his Large Sculptures. Six works, each somewhere around the size of a crumpled adult, lie on large white plinths. 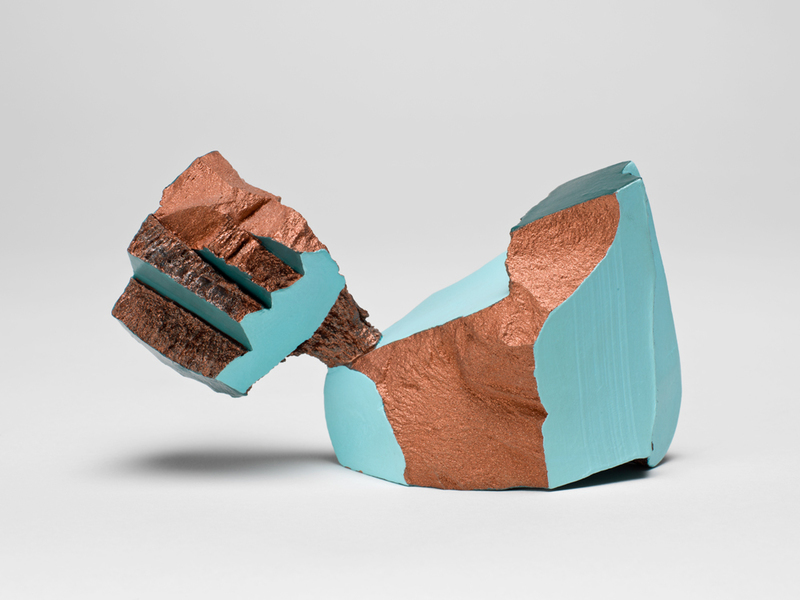 Like his earlier sculptures, they play with surface and interior. The plastic-seeming (but actually bronze) surfaces of these large sculptures are unbroken, but their appearance hovers between translucent, revealing an interior color, or just burnished so that at each angle the secondary colors reveal or hide themselves. And the color juxtapositions are pleasantly jarring: a dark brownish-purple surface with orange, a night blue with a dark kelly green. The forms seem to take their cues from soft-edged and goopy children’s toys: thick nubby forms curled or splayed onto their pedestals. They also appear in Price’s drawings, a couple of which are on display here. In drawing, he plops the shapes into rough, rocky landscapes, highlighting their eccentricity. 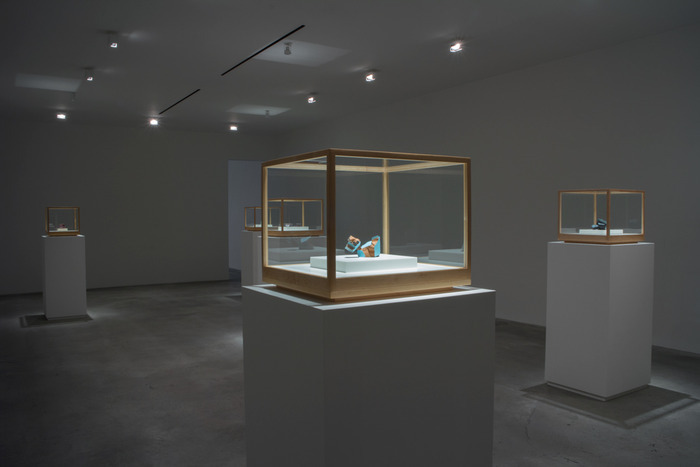 Installation view from Ken Price: Specimen Rocks, May 9 – June 28, 2014, Matthew Marks Gallery, New York; Artwork © Estate of Ken Price / image Courtesy Matthew Marks Gallery. Next door, Specimen Rocks shows us another sculpture series from the mid-1980s. These baseball-sized works are displayed as if they were in a museum of natural history: wood and glass vitrines on high pedestals lit from above. They invite visitors to circle, peer, and point. One could make a case for Price as a science fictionalist, creating the geology of a distant but similar planet. Most of the works contain clean geometric forms cut into (or away from) rough rock. The boundaries between interior and exterior are at play, but it’s enticingly unclear if the forms are eroding or being built up. Again, the colors are weird and bold: in Reltny (1983) Price splices glittering pyrite-like forms into a bright, smooth, turquoise blocks. In both exhibitions, the size of the works goes against common sense, adding to their mystique; one could shrink down the large works into appealing small sculptures, and picture the “specimen rocks” on a glacial scale. Both exhibitions offer distinct and formally coherent sets of works that look nothing like each other. Against the grain of dematerialization and conceptual practice, Price’s work presents a compelling case for physical form: for its material subtleties, for its power to surprise and delight without social-historical context, for its own internal logic. It’s clear that Price could have gone on sculpting for another fifty years, staying within the lines of his own work without ever repeating himself.